We find ourselves on the cusp of some very interesting dynamics in 2019 from a healthcare technology and innovation perspective. Advances in artificial intelligence (AI) including machine learning, natural language processing (NLP) and robotics have shown incredible promise in terms of automating repetitive manual tasks as well as improving decision making. 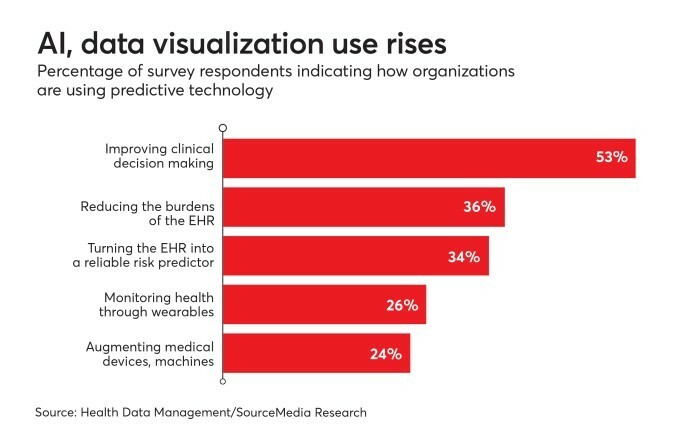 Leaders in the healthcare industry—as well as technology vendors—are witnessing this first hand and are planning to integrate AI with next generation analytics platforms to empower executives, clinicians and analysts with unprecedented actionable insights from the board room to the point of care. Here are some key trends enabled by AI that are empowering stakeholders across the healthcare continuum, from policy makers and executives, to physicians and patients. Thanks to the meaningful use stipulations of the Affordable Care Act (ACA), a majority of the healthcare systems in North America have made significant investments in electronic health records. These deployments have often been multi-year initiatives often running over time and over cost, not unlike ERP deployments in other industries. While EHRs have helped hospitals create a central repository of their clinical and financial data, extracting accurate, reliable, and actionable analytics for right time decision-making is a daunting challenge. Leading healthcare organizations have deployed next generation analytics platforms to deliver actionable insights integrated into their EHR clinical workflows to empower their executives, clinicians, and nurses at the point of care (POC). In 2019, they will bolster this by integrating machine learning and NLP algorithms to enable predictive, analytics-powered patient risk stratification, to proactively identify the most at-risk patients—patients likely to exceed length of stay, and/or at risk of 30-day re-admissions. Machine learning and NLP integrated with next-gen analytics will also enable researchers and clinicians to identify variances in genomic profiles in newborn patients, and personalize treatment protocols. This will help determine the appropriate clinical care protocols and care coordination to ensure higher quality at a lower risk and cost. The proliferation of wearables like Fitbit and Apple Watch has resulted in the “Quantified Self Movement” and engaged cohorts of fitness conscious individuals who share their fitness data with their communities of friends and family to stay healthy and in shape. Thanks to advances in these devices, such as the EKG capabilities in the Apple Watch, heart rate monitoring in the Fitbit, continuous glucose monitoring (CGM) sensors, and smart phone apps from leading medical device manufacturers— as well as personal health monitoring apps from Tactio Health, Apple Health, and Fitbit—patients with chronic diseases like obesity, diabetes, congestive heart failure (CHF) and chronic obstructive pulmonary disease (COPD) Source can monitor their vital signs (weight, blood pressure, glucose) on a daily basis to effect fundamental changes to their diet and lifestyles. In 2019, we will likely see the evolution of patient-created communities centered on specific chronic diseases (especially diabetes, often referred to as ‘the epidemic of the 21st century’) that leverage data and analytics from wearables and devices. These communities will be able to share their best practices around alternative forms of treatment, disease monitoring, diet and exercise, to drive wellness and disease management for the entire community, similar to the model pioneered by ‘Patients Like Me’. This trend is being accelerated through incentives to stay healthy offered to employees by employers and health plans. By continuously monitoring lifestyle changes using technology tools, overall employee cost of care for or covered patient population can be reduced. The United States is in the throes of an unprecedented opioid epidemic. More than two million Americans have become addicted and abuse prescription pain medications and similar drugs available on the street. During 2016, there were more than 63,600 overdose deaths in the United States, including 42,249 that involved an opioid (66.4%). That's an average of 115 opioid overdose deaths each day. The time has come to tackle this epidemic on a war footing with the tools and platforms of the 21st century. Crafting a national Opioid Disease Registry enabled by self-service analytics and providing visibility to policy makers, healthcare providers and citizens at large, similar to the Blue Cross Blue Shield National Health Quality Index would be a step in the right direction. This would enable states, communities and health organizations with a reliable picture of the extent of the opioid epidemic in their communities, as a first step. Monitoring the number of opioid cases in the ERs mapped to the associated opioid, based on actionable analytics would help these communities address the challenge head on. Proactively distributing take home Naloxone kits to patients and their families to rapidly reverse opioid overdose and restore normal respiration to a person whose breathing has stopped, would go a long way to reduce the large number of fatalities resulting from opioid overdose across the nation. 2019 indeed promises to be a watershed year for healthcare when advances in artificial intelligence (machine learning, deep learning, natural language processing and robotics) will intersect with next generation analytics. This will enable automation of manual, repetitive processes and rapid decision- making powered by actionable, predictive insights that will empower executives, line of business (LOB) leaders, clinicians, nurses, and even patients to make better and more informed decisions about healthcare diagnosis, delivery, and personal wellness and disease management at a scale that is unprecedented—yet collaborative. The future of innovation in healthcare is indeed exciting with the promise of enabling superior patient outcomes at a lower cost, with insights enabled efficiency and productivity.